Joy Creek Photo Archive (c) all rights reserved Lilium martagon v. album has been a highlight of our Rose and Clematis border for many years. There it has increased to form a sizeable clump. Whorls of lance-shaped leaves rise up the lower portion of the stem. Individual racemes rise above the foliage reaching 6 feet in height and bearing up to 50 turkscap lilies. 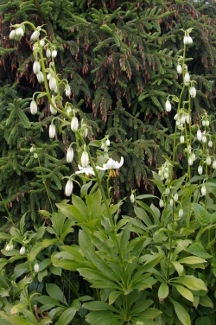 The flowers are about 2 inches in width.